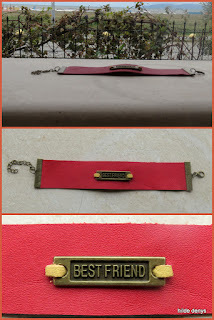 Hilde's LoveLea Leatherworld: Balance is what I need! Balance is what I need! My grandmother had a fur stole that she wore to church in winter. It had legs dangling from her back and on the front side, the stole had a flat head with glittering eyes; I was very afraid of the beast. Her stole is mine now and I am not afraid anymore; on the contrary, I love the beast because it keeps me warm. Unfortunately the legs are disintegrating, falling apart in little pieces. I am not able to throw away something, I keep EVERYTHING and good I did: I used this pieces to garnish a bracelet that otherwise would have been very plain. I didn't have any clams then and I made a button myself out of 2 layers of hard leather; it was a hard job cutting through the leather. The layers are kept together with a big vintage turquoise bead; a slit functions as a buttonhole. I made a similar bracelet in pale brown leather; they look very "steampunk". It is done: we said goodbye to 2017 and welcomed 2018; nothing much, a little celebration between my husband and me, too tired to throw a big party. Besides, only 3 days before, the 29th, we celebrated our 42 th wedding anniversary and a second celebration so close felt too much this year. As I am writing this words, it is the first day of a whole New Year; in front of me is a clean slate, a blank paper that I can fill in as I want. I decided to pick "balance" as theme for this year. 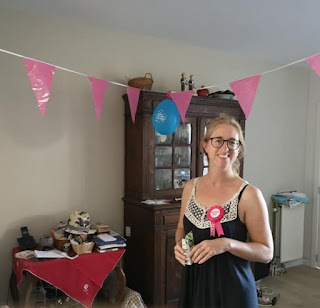 Do you remember my thyroide story? You can read it here. It is obvious that I am not well balanced and I want to do something about it. The whole of 2018 will be dedicated to find my balance. Most urgent and important is the balance between my hobby and my family life and husband! In a lesser degree I should find my balance between earning 4 figures or 5 figures, between reading and working, between sleeping and working, between working and relaxing. It is the coffee that keeps me going, urges me to continue, drives me to do something and I only drink two cups a day. Even knowing that, I can't let go of drinking coffee; surrogate is not an option, I want the real thing! If it is really too bad, I only have 1 cup a day and then I'm balanced again. The next celebration in line is Valentine's day and I want to design something for young people. Usually I don't pay much attention to this commercialized celebrations; in this case I think Valentine's day is good for shy people. It is a shove in their back, a move into the right direction, it is a golden occasion: now or next year. It is nice and sweet if gifts, as a symbol of feelings, are given or exchanged in the intimacy of 2 people. Two years before I retired, the principal introduced Valentine's at school. If I recall right, the last hour of the school day, the seniors were free, free to give the beloved classmate a red rose. And when the last bell rings, euphoric students are running in the hallway, a bunch of roses in their hands, others a couple of roses and the biggest part has their hands empty! That's a punch in the face of this students. I had this metal plaques with "love" and "best friend" laying around for almost a year and I felt like it was time to use them! 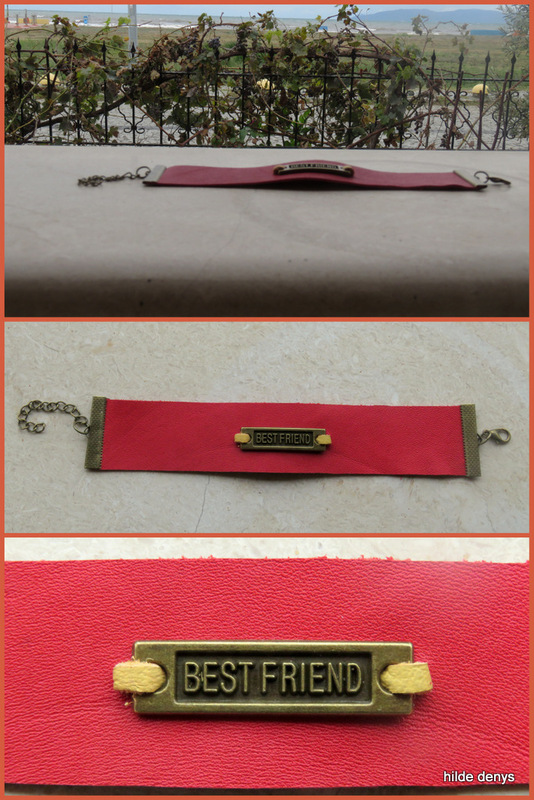 I designed and created this cute bracelet in red leather, love's color with a little yellow accent to match the metal and the clamps. I wonder who will wear this bracelet! We are now in the middle of the moving, half of our belongings are in the new house and the other half here. Friday, the van is coming and we'll move all the big, old heavy furniture; maybe we'll sleep in our new bed by Friday. But first I have to make sure we have gas and electricity, telephone and internet and this won't leave me time for designing and creating. And I owe you a picture of the still empty workshop. As you can see, like the new year, a blank paper, a new begin! If this is not a coincidence or synchronicity! Please, let me know what kind of New Year resolutions you made, you could inspire me, one never knows; what do YOU think of Valentine's day? Do you love it or hate it? Leave your comments right below, please.